The latest addition, Inspection Maps, allows users to create customized layout templates for measuring blade coordinates, blade thickness, and local pitch! It is common practice to inspect marine propellers to ensure the manufactured product meets the thickness and pitch specified by the design. PropCad Premium introduces a powerful tool for propeller builders and manufacturers – Inspection Maps. 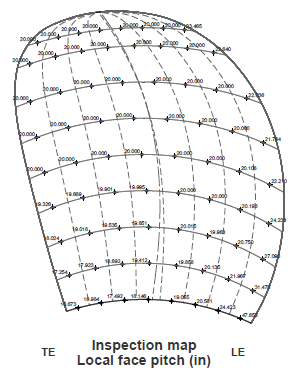 HydroComp’s Inspection Maps is a tool to aid in the measurement and inspection of marine propellers during the manufacturing process. These maps provide guidance for propeller craftsman and foundry workers, allowing them to quickly identify the inspection points on the blade and ensure appropriate thickness and local pitch values. 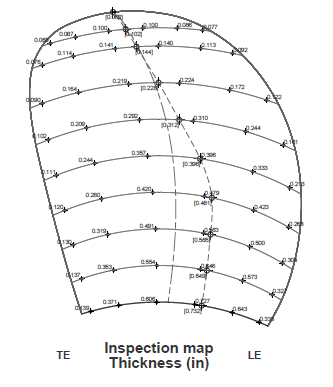 Thickness map – This template provides the local thickness values of the blade at each inspection point. The maximum thickness is also identified and labeled separately. Local pitch map – This template provides the measured value of local pitch for a segment of the blade surface at each inspection point. XYZ location map – This templates provides the coordinates of the inspection points in a Cartesian coordinate system. Each inspection point has an X value representing the axial height of the blade at a specified Y and Z ordinate from the shaft axis. X-R-Theta location map – This templates provides the coordinates of the inspection points in a cylindrical coordinate system. Each inspection point has an X value representing the axial height of the blade at a specified radius (R) and angle (Theta) from the shaft axis.